I love to knit. I find it very therapeutic, especially with little people to knit for! Little projects get finished so much quicker than big projects and I guess I am someone that benefits for more instant gratification! When at the school the children loved it when I knit. Having me present and working quietly seemed to create a much more gentle atmosphere. I learned this little ‘trick’ from the local Waldorf school and it truly is amazing how it works. I found that I interfered less and the children then seemed to work things out between them. But I certainly was not neglecting them or ignoring them. I chose my projects very carefully, ensuring that, whilst I looked busy, I was in fact very aware of the children at all times. Therefore simple projects (hats, scarfs, felted slippers) were what the time called for. Sometimes simply just winding wool. The children would frequently come and sit by me, sometimes individually, sometimes in groups, to talk about what I was making. They would often talk wistfully of what they would make when they could knit or sew. Some would quite clearly state that they could already knit and then find objects with which to do so. Favourites were a couple of crocheted potholder squares and some popsicle sticks. The children would sit together for ages in a little “knitting circle” and work whilst chatting about other things. It was very lovely to see. They were so creative also when talking about what they were making. But then came the questions about when they could really learn to knit. They were becoming less satisfied with what they were doing and wanted the real thing. I tried finger knitting, but they were not quite ready for that. 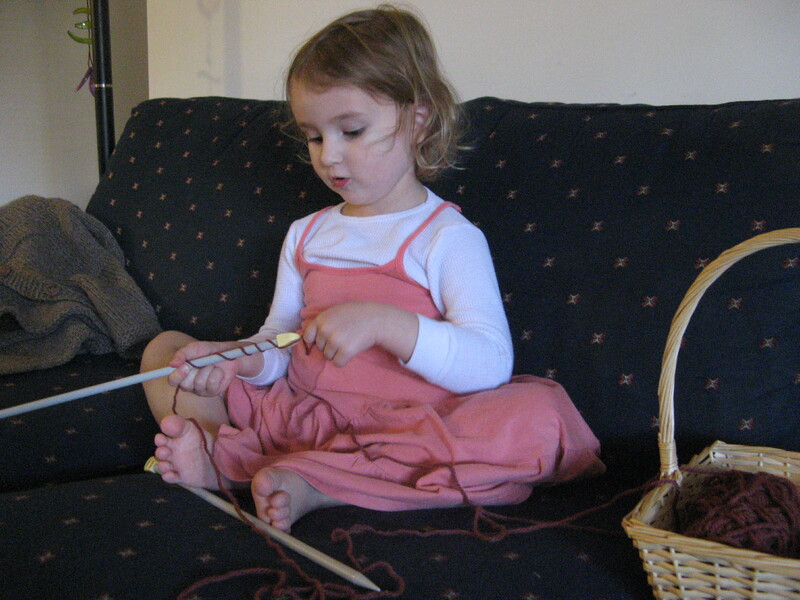 My daughter now has her own knitting basket and is immensely satisfied. 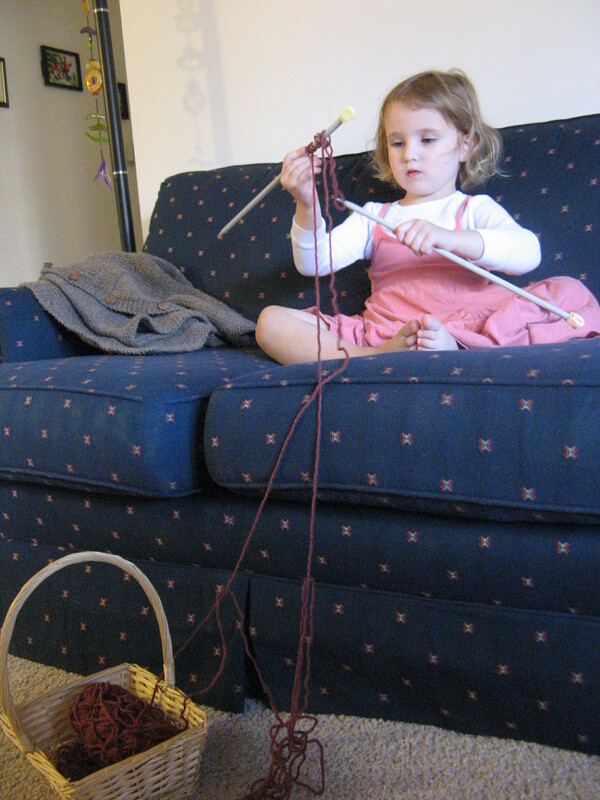 She has a ball of yarn (usually more a large tangle than a ball actually) and two large knitting needles. She contentedly sits there and “knits”. I don’t correct her and actually she doesn’t want to be taught. She wants to explore and feel like she is knitting her way.